Z Blok was the only sunscreen I used for our recent 22 day hike and climb of Mera Peak in the Nepalese Himalaya. The non greasy formula was perfect for use on an expedition where the first shower was on day 18! I'll never sail or climb without Z Blok in future. Q: When should sunscreen be used? Sunscreens should be used every day if you plan on being outside. Even sitting by a window at home or in a car exposes your skin to the sun’s UVA rays, which penetrate glass. On a cloudy day, up to 80 percent of the sun's ultraviolet rays will pass through clouds. Q: How often should sunscreen be applied? Most sunscreens should be applied to your skin 15 or more minutes before going outdoors. But sunscreens with zinc or titanium oxide work right away because their efficacy is not dependent on being absorbed into the skin. When applying sunscreen, pay particular attention to the face, ears, hands and arms, which typically get the most sun exposure. Also apply a lip balm that contains sunscreen with an SPF of 30. All sunscreens should be applied at least every 2 hours if swimming or perspiring heavily. Even sunscreens that claim to be water resistant lose their effectiveness with time and water exposure - you must re-apply to protect your skin. Q. What is the difference between UVA and UVB rays? UVB rays are the cause of sunburn on the surface of the skin. SPF only measures protection against UVB rays. UVA rays cause DNA damage to the cells deeper within the skin. It is this layer of cells that regenerates our skin and it is feared that damage to the DNA of these cells may increase a person's risk of developing dangerous types of skin cancer. UVA rays cause a substantial amount of skin damage (80-90% of premature aging of the skin is due to UVA rays). Only sunscreens with the statement “Broad Spectrum Protection” on the front of the package have passed the FDA’s critical test for effectively blocking UVA and UVB rays. Q: What does SPF mean? SPF stands for Sun Protection Factor. Sunscreens SPF ratings refer to the product's ability to prevent sunburn caused by UVB rays. SPF does not indicate how well the product protects against the sun's harmful UVA rays. Q: Does SPF 30 have twice as much sun protection as SPF 15? Not even close. SPF protection does not increase proportionately with a designated SPF number. For instance, an SPF of 15 blocks 92% of UVB rays and an SPF 30 blocks 97% of UVB rays. And no SPF number blocks 100% of UVB rays. Google the government report “The Burning Facts” to get the real facts. Q. What type of sunscreen should I use, and what ingredients should I look for? There are many types of sunscreen, so selecting the right one can be difficult. Ideally you should choose a sunscreen that has an SPF of 15 or higher as far as protecting against UVB rays are concerned. Obtaining a broad spectrum of sun protection against both UVA and UVB rays is also extremely important. Currently, the broadest spectrum of coverage may be obtained with sunscreens that contain zinc oxide. This active ingredient provides the best protection. There are certainly cheaper formulas, but usually you get what you pay for. Q: Is there a safe way to tan? Simply put, no. A suntan is the result of the skin's response to an injury. Tanning occurs when the sun's rays penetrate the skin and cause the skin to produce pigment to protect it. Exposure to the sun accelerates the aging process and increases the risk for all types of skin cancer. If you want to look pretty, smile a lot. Everyone will love you for it, and there is no apparent downside. Zinc oxide is best known as the sunblock of choice for lifeguards who spend all day in the most intense sunlight. Indeed, a recent study by the EPA ("The Burning Facts") concluded that zinc oxide is the only active ingredient to provide "extensive protection" from cancer causing UVA rays in addition to UVB rays, which is what SPF measures. The first question most people ask about zinc oxide is "will I look pasty white like a life guard?" In the case of Z Blok™ (the Z stands for zinc oxide) the answer is no. 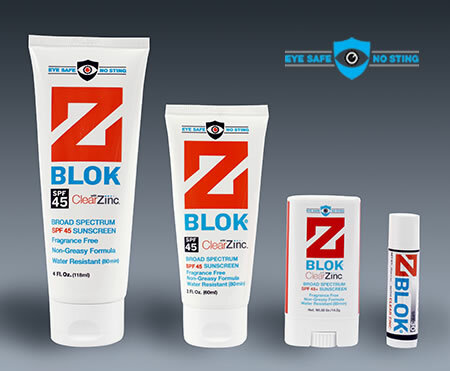 The zinc oxide in Z Blok, called Clear Zinc™, is finely ground so that it will rub in clear. It is slightly harder to rub in than watery sunscreens, but totally worth the effort.